Philadelphia Eagles quarterback Nick Foles (9) makes a pass against the Cleveland Browns during the first quarter at FirstEnergy Stadium. If this was supposed to be a dress rehearsal for the first team on both sides of the ball, one half of the team is ready for showtime and the other looks like they walked on stage naked and forgot all their lines. There's no other way to explain the Eagles putting up a goose egg and looking so inept in Cleveland during the first half on Thursday night. • Derek Barnett dropped back in coverage on third down and made an immediate tackle to force the Cleveland Browns into a punt. That is not something I would have expected to see and was a nice surprise for a guy who should be expected to take a big step forward in year two. • The competition between Avonte Maddox and Sidney Jones for the starting nickel corner spot is one of the biggest points of intrigue left during the preseason. That battle will continue right up until opening day, but it was the latter that made the most of his opportunity early in the game Thursday night. On Cleveland's first big drive, Jones was targeted twice in the red zone, and both plays ended with incompletions for the Browns in a critical spot. Throughout the first half, you saw Jones pop up not as a victim of successful pass plays, but as a reason they never developed in the first place. That's a welcome sign for Howie Roseman and Co., who bet on his talent in last year's draft in the hopes he would be able to make a big impact when he got healthy. That may turn out to be another stroke of genius from a front office that has had a few of those lately. • Fletcher Cox has noted he wants to make a real run at Defensive Player of the Year. His work in the preseason suggests that's not an empty claim. Cox has consistently been around the ball and disrupting plays in the backfield during the preseason, and while Philadelphia's top offensive group has looked pedestrian, their defensive starters are having a decent enough go at it. • We'll get to the bad with Nick Foles in a minute, but with a chance to get his feet under him late in the first half, Foles finally looked like the guy we saw carve Minnesota and New England to shreds in the playoffs last season. We saw passes with touch, dump offs, and subtle pocket manipulation from Wentz's stand-in on the team's longest drive of the half. 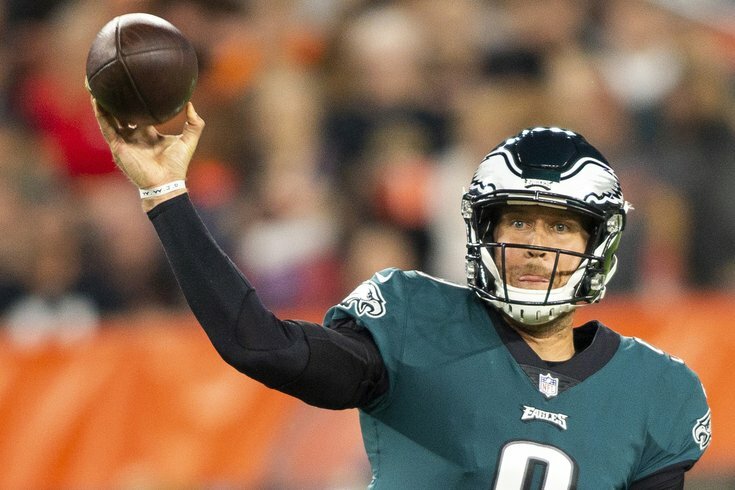 And maybe all that says about Foles is what's true of plenty of quarterbacks around the league — if you give him time to get into a rhythm, he can be dangerous and is plenty capable of leading a successful Eagles offense. The Eagles chewed up yardage once they stopped shooting themselves in the foot, and Foles was a big part of that success. If only that was the story of his half, and not just one small stretch. It certainly didn't help matters that he punctuated that drive with another turnover. • Halapoulivaati Vaitai has been having a rough preseason, and it didn't get any better in the first half against Cleveland. On a fourth-down play midway through the first, Vaitai committed a hold in order to stop a hellacious bull rush from last year's No. 1 pick Myles Garrett. Garrett is talented, and these things happen. But on the very next play, Vaitai got away with what should have been a false start and then still gave up pressure on his side that coerced Nick Foles into throwing the ball early and short of the sticks. That was a common theme throughout the first half, with Garrett absolutely abusing Vaitai and punishing Foles as a result. There are worse people to get torched by than one of the most talented young linemen in the league, but the degree to which Vaitai got beat was straight up unacceptable. • Let's throw the usual disclaimers in here — the preseason doesn't mean much, and the Eagles just won a Super Bowl with Nick Foles playing the best football of his life. That said, isn't it starting to get a little concerning how out of sorts he has looked through two preseason appearances? Four of the plays Foles was responsible for in the first half: falling down in his own end zone for a safety, fumbling the ball on a sack for a second consecutive week, throwing a lame duck interception that never had a chance to reach Mike Wallace, and throwing another interception trying to force the ball into Zach Ertz. Only the second item is excusable, simply because the blocking from Vaitai was so poor that Foles was left with little room to operate. Even with the aforementioned struggles of the man protecting his blindside, Foles has reverted to some of the bad habits that left him as a backup quarterback in the first place. The offensive line play around him was mostly brilliant in the stretch run, but Foles played the best football of his career by moving confidently in the pocket, stepping up when he needed to and unloading the ball at just the right time. We've seen very little of that Foles, whether that's because he and the group around him or rusty or because last year's run was aided by smoke and mirrors. And while optimism remains that Carson Wentz will be prepared to start the opener, it would be a little more reassuring if their backup plan looked more competent in the team's big dress rehearsal. • Best of luck in your future pursuits, Matt Jones. Pretty sure your time in Philadelphia is about up. This is all I have left to offer on his play after he caused an INT last week and put the ball on the turf this week. • Jason Kelce got to the outside to block for a Wendell Smallwood run early in the first quarter, and the subsequent first down was the only positive result of the play. An awkward fall left Kelce in pain after the play, and he came off immediately to be replaced by Isaac Seumalo. The severity of Kelce's ailment is still unknown — he did return to play on the next series, so seems it's not too serious — but needless to say it would be a severe downgrade if the Eagles had to spend any extended time with Seumalo at center. Kelce's backup has struggled with just the snapping portion of the job, to say nothing of how short he falls of Kelce's excellence at the second level. No more injury scares or actual injuries, please. • We tend to focus on the hometown team here, but a moment for Hue Jackson — what kind of jackass gashes a team all the way down to the goal line and then throws four consecutive times? Not a single run play there? Whew.